just noticed this in the regs.." no gap between the rear sprocket and the chain guide, " How does a std 84 husky chain guide go in this regard?? This is the correct arrangement. 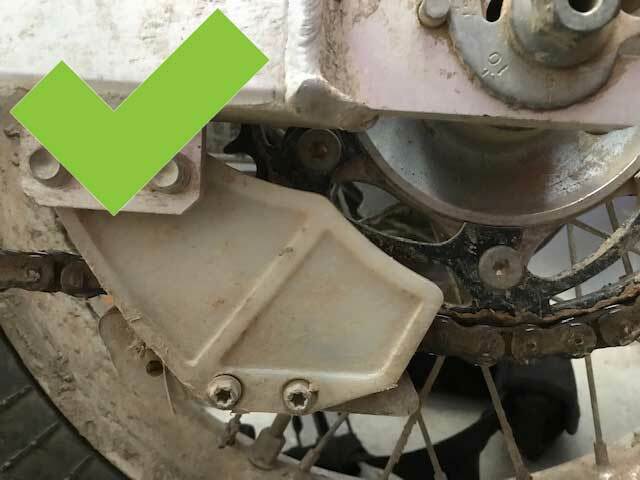 The guide covers the space where the chain meets the sprocket on the underside of the swingarm. There's no chain on this bike, but you get the idea... This is a non-compliant arrangement. This gap needs to be covered. Please note that early bird entries close tomorrow (Friday 8 March). 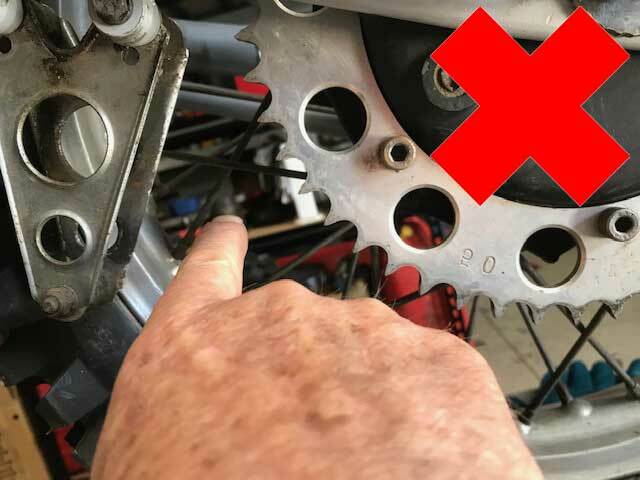 you often see people moaning about this rule, and it does seem an unlikely danger, but I have a relative who actually fell off and somehow got his hand between chain and sprocket . This happened many years ago before any rules about chain guards . Reminds me of when i was around 13yrs old and moving my ts90 around in the shed in thongs and somehow ?? got my bigtoe caught in sprocket -bike went forward and punched a sprocket tooth straight thru big toenail then the whole lot came down on top of me hahaha! wasnt funny at the time nasty little honcho !? The A3VE gets a plug in the latest edition of Old Bike Australasia (#78). And, hot off the press there's an A3VE ad in VMX magazine (#77). Make sure you all support these publications that support our sport! Got your A3VE entry in yet? Don’t worry, there’s still plenty of time to get yourself a position on the start line of the first edition of the Australian Three Day Vintage Enduro. But be warned - We have brought the closing date for entries forward by a week from 17 May to 10 May 2019. This has been done to ease administrative pressure and free up time for us to take care of crucial tasks in the week leading up to the event. Entries have been strong, but we’d really like to see some women enter this event, as there is a dedicated class (VW). Some more entries in the pre-1976 (V1) class would be nice too. If you’re not riding we could definitely use a hand, especially in the week leading up to the start. Contact Peter Drakeford on 0422 299 003 if you can help. 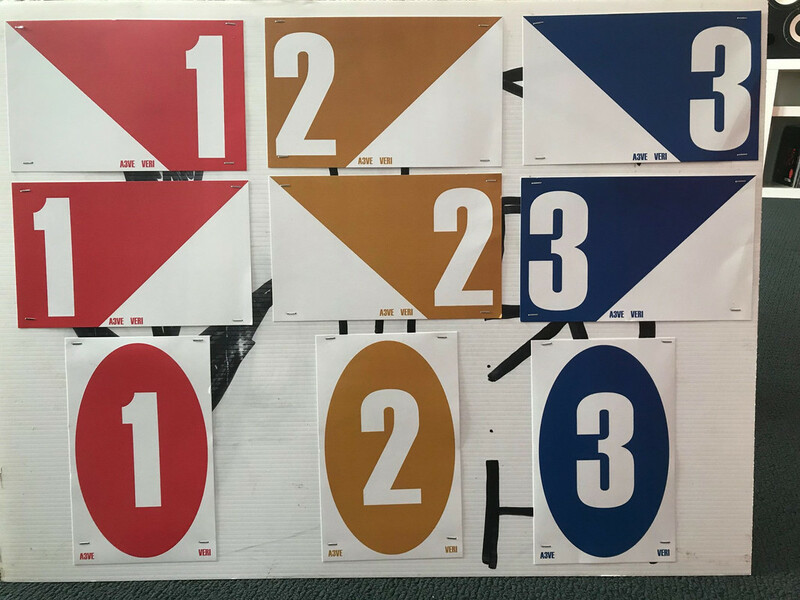 Check out the marker arrows that we'll be using at the A3VE. They'll be colour coded for each day. The oval ones are to indicate that you should proceed straight on. We'll also be using some generic ones for 'wrong way', 'danger', etc.